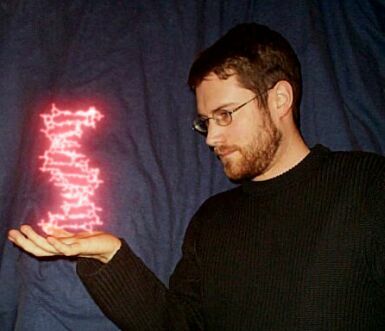 « Genomics, evolution, and health: comparisons of avian flu genomes. Today, April 19th, is the anniversary of Charles Darwin‘s death in 1882. 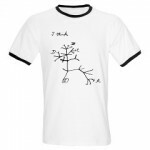 I refer you to an excellent post by PZ Myers on Pharyngula about the details of Darwin’s passing [The Death of Darwin]. 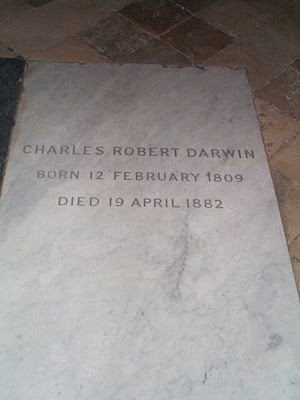 Darwin is buried at Westminster Abbey in London, within a few yards of Sir Isaac Newton. There is a bronze bust of Darwin as part of a memorial to several scholars near the grave that was installed by his family in 1888. The grave itself is very understated, a simple marble slab in the floor marking his name and the dates of his birth and death. 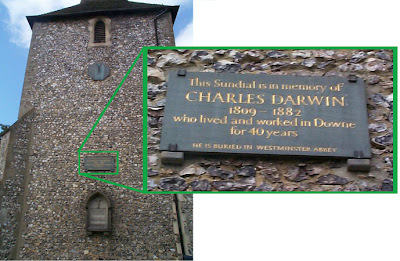 There is also a memorial to Darwin in Kent, where Down House is located, in the form of a sundial on the side of the local church. Charles Robert Darwin, 12 February 1809 – 19 April 1882. 1 comment to Darwin’s death. ARG an awful thing that happened in April I missed! How did I miss this one?? ?